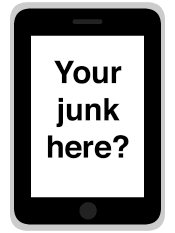 Should I text a pic of my junk? You would think that people -- especially public figures -- would have figured out by now that texting or messaging explicit photos of themselves to other people is a generally bad idea. You would also be wrong. There is, of course, Anthony Weiner. And on Thursday it came out that Saratoga Springs police chief Christopher Cole had texted an explicit picture of himself from his office in city hall. Not so bright, chief. 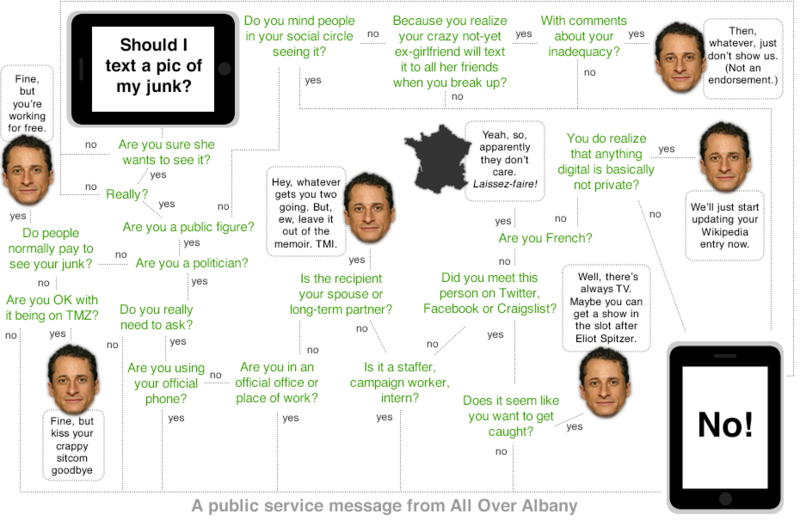 The flow chart is above -- scroll up. Dan Savage had a good take on this today. Basically, if there is any doubt that the woman is the type of lady who wants to see pics of your junk, (which is like, oh, 0.8 percent of the hetero female population,) you should not send pictures of your junk. It really depends on your measurements. THANK YOU. I firmly believe that AOA is a voice of reason in our uncertain times, and as that voice of reason, is duty-bound to ensure that New Yorkers only text pictures of their naughty bits when it's absolutely necessary (which can be often, if you're someone like me). Thank you for creating this helpful diagram. It is my deep hope that we can eradicate unneccesary sexting within my lifetime. "Should I text a pic of my junk?" -> "No!" "Junk Removal Same Day," says the ad on the top of my screen. Ouch! Ugh. That Rob Delaney video was painful to watch. Do you have a name synonymous with a mans private area? Then CAPS LOCK NO. And I'm not just talking to the Weiners of the world. There are a whole lot of Dicks, Jimmys and Johnsons out there who especially shouldn't.